I just got this one today. 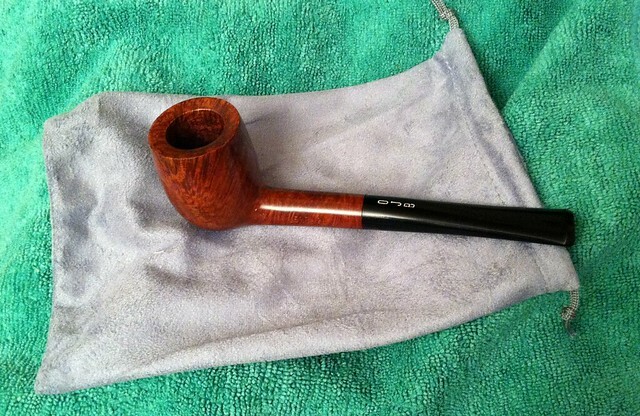 Another unsmoked estate pipe, and according to the seller what makes it even more rare is that this Ehrlich OJB billiard is a sitter pipe fitted with a magnetic heel. This is the first time that I learn of the OJB line and I don't even know what the initials mean. The price was more than right, it is unsmoked and, as you may know by now, I love a billiard. I just got this one today. Another unsmoked estate pipe, and according to the seller what makes it even more rare is that this Ehrlich OJB billiard is a sitter pipe fitted with a magnetic heel. I've never heard of that before, Ed. Have you tried sticking it on the fridge? No need. I have a magnetic pipe rest and also a metal tray that I use for my pipes. It sticks to all of them. When on the tray there is no need for a pipe rest. It's a sitter anyway. Hey, I wasn't trying to be a wise guy...just asking if the magnetic bowl really adhered to a surface. Yes, as magnets are wont to do, it adheres to any surface wrought of real metal. I'm sure that it came in handy back in the days of metal car dashboards. Or metal desks. I had one in the 70s. I don't think a heel magnet would hold a pipe in place on a dashboard after the car hits a bump. Unless the vehicle has very good suspension. Well that is a curiosity.